Estimated based on press releases and best-guesses. 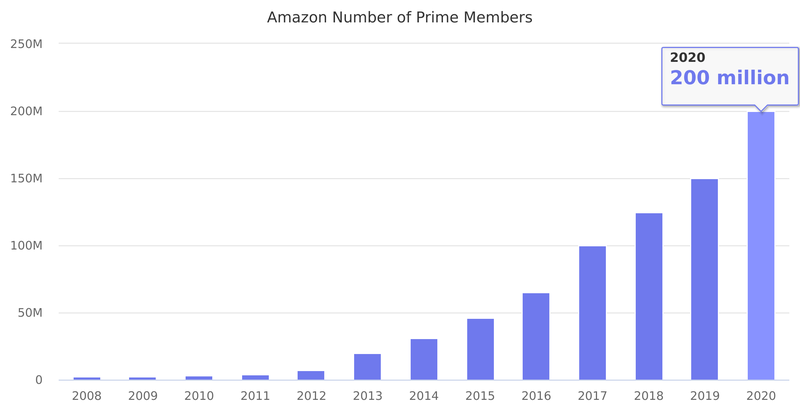 Amazon Prime was announced in 2005. Amazon Prime is a subscription service that gives customers access to free shipping, streaming items on Amazon Music and Amazon Video and other benefits for a monthly fee of $10.99 or yearly fee of $99. Customers with Amazon Prime subscription get free two-day shipping for most products. Marketplace sellers using Fulfillment by Amazon (FBA) to warehouse their products benefit from this too as their products are also available as part of Amazon Prime shipping. According to latest 10-K annual report, retail subscription services revenue was 2014: $2.762 billion, 2015: $4.467 billion, 2016: $6.394 billion. This was used to estimate prime members number. From 65 million in 2016 it increased by 54% to 100 million in 2017.